Wellness exams keep your dog as healthy as possible! A regular wellness exam by one of our veterinarians, combined with a thorough history and your observations at home, can often detect potential health problems your dog may be experiencing. To assure a longer and highest quality of life for your dog, bring your dog to us for a wellness exam at least annually [older pets or those with health problems may need more frequent exams]. The wellness exam is an opportunity for you to discuss any concerns you have about your dog’s health with one of our veterinary professionals. Topics ranging from nutrition, allergies, and bad breath, as well as mobility issues, risk of infections and any lifestyle and age related changes, are all important for your dog’s health. 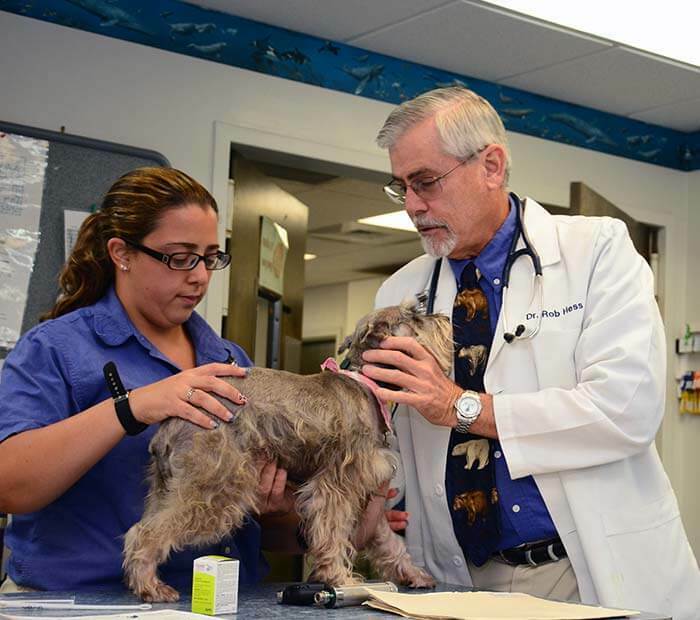 Our veterinarians’ expertise is at your disposal. At Winter Park Veterinary Hospital, all aspects of your pet’s medical and wellness heath are encouraged discussions! Vaccines have proven important in preventing serious disease in dogs and cats. We design a personalized vaccine protocol for each dog, maximizing protection against the diseases your pet is likely to be exposed to while using the fewest vaccines possible. Our current vaccine recommendations are based on up-to-date research and the incidence of disease in our area. During your pet's exam we'll ask you questions to assess your pet's individual risk, based on his/her lifestyle, and then design a customized vaccine protocol. This can be modified as needed when that lifestyle changes, so be sure to let us know so we can keep your pet protected! Dogs are susceptible to a number of internal parasitic infections, several of which are able to infect people in addition to animals. Therefore, parasite prevention is not only important for the health of your pet, but also for the health of your family. Fleas and ticks are troublesome parasites of the skin. Flea and tick prevention is important because these pests not only cause problems with the skin, but they also possess the ability to transmit a number of diseases to the dog. Fortunately, there are many safe and highly effective products available at Winter Park Veterinary Hospital that will treat and prevent flea and tick infestations. Regular use of one of these products will effectively prevent fleas and ticks from becoming a problem for your pet! Heartworm is a worm that resides in the heart and lungs of infected dogs. It is transmitted by mosquitoes that transmit heartworm larva from dog to dog when bitten. These larva then develop into adult worms that over time cause heart disease and respiratory problems in dogs. Fortunately, this is a preventable disease, and there are a number of excellent monthly heartworm preventatives available at Winter Park Veterinary Hospital. These products, when administered year-round, provide outstanding protection against heartworm disease. Our team at Winter Park Veterinary Hospital will help guide you through which product and prevention plans are best suited for you and your dog! During your dog’s wellness exam, your veterinarian may suggests a professional dental cleaning for your dog. For more information about Winter Park Veterinary Hospitals’ dentistry services, please click on dental care, listed under general medicine. For extensive details about Winter Park Veterinary Hospitals’ nutrition and diet counseling, please click on Nutrition and Diet, listed under services. If you any questions about your dog, please give us a call. We are here to help. Contact us to schedule a canine wellness exam for your dog.